Misplacement of central venous catheters: Was excessive length of the guide wire responsible? Central venous access is required in chronic kidney disease patients for short-term hemodialysis access and during renal transplant surgery. Catheter misplacement in these patients may lead to complications such as recirculation during hemodialysis or erroneous measurement of central venous pressure apart from other problems. Reported here are two interesting cases of misplacement in such patients. All cannulations were undertaken using aseptic precaution under local anesthesia and routine monitoring along with ultrasound guidance. Case I: Right internal jugular vein cannulation was performed with a 12-French hemodialysis catheter (Trilyse-cath, Vygon, Aachen, Germany) in a 40-year-old male [Figure 1]. Postprocedure chest radiograph showed the hemodialysis catheter in the right internal jugular vein with its tip pointing cephalad. Case II: A 40-year-old male was posted for renal transplant surgery. Left internal jugular vein cannulation was performed for perioperative management (Certofix ® B Braun Melsungen AG, Melsungen, Germany). 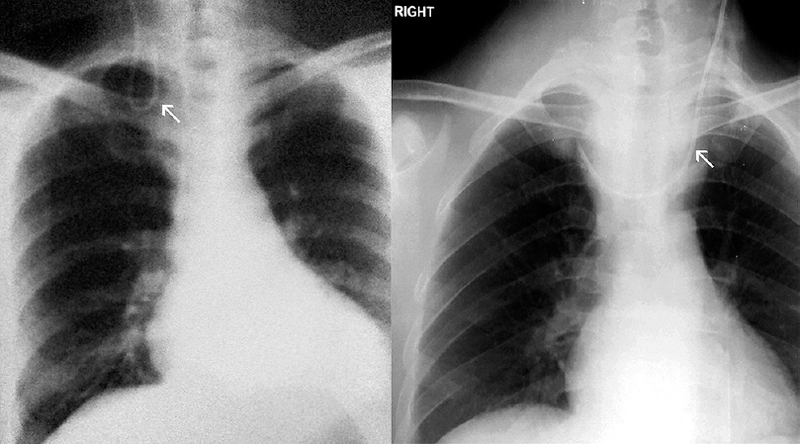 Postprocedure chest radiograph revealed the central venous catheter tip facing right subclavian vein [Figure 1]. Both the patients were hemodynamically stable and did not complain of any pain. There was no history of previous catheterization through the same vein. The patients were transferred to the cardiac catheterization laboratory for evaluation and possible repositioning of the catheter. Venography under image intensifier showed a quick caudad run off of the dye and revealed no supracardiac venous anatomical anomaly. Repositioning was done using Seldinger guidewire under image guidance. Both the catheters were used uneventfully thereafter. The misplacement of the central catheter often follows that of the guidewire whose J-tip direction determines its ultimate path. We also know that the guidewire J-tip may get deflected by an obstruction like the junction of vessels, during its insertion. We took help of the catheterization laboratory facility to evaluate what caused the guidewires' misplacements. Our main concern was that some anatomical anomaly like a persistent left superior vena cava might have caused a deflection of the guidewire. The use of contrast before and after repositioning ruled out any obvious anomaly. Repositioning without proper evaluation can be catastrophic. We feel that an excessive length of the guidewire was introduced initially, which contributed to these unusual misplacements. We speculate that j-tip of the guidewire got deflected by hitting the vessel wall at the junctions and assumed their final positions. The catheters were introduced over these misplaced guidewires to lie in the same position. We suggest not to insert excessive length of the guidewire as it may lead to misplacement apart from causing other problems like cardiac arrhythmia. Repositioning of such misplacement should be undertaken only after proper evaluation of the supracardiac venous anatomy. However, the use of radiocontrast material should be undertaken with caution in this group of patients. Tripathi M, Dubey PK, Ambesh SP. Direction of the J-tip of the guidewire, in seldinger technique, is a significant factor in misplacement of subclavian vein catheter: A randomized, controlled study. Anesth Analg 2005;100:21-4. Dubey PK. Beware of the twisted guidewire. J Clin Anesth 2008;20:70-1. Schummer W, Schummer C, Fröber R. Persistent left superior vena cava and central venous catheter position: Clinical impact illustrated by four cases. Surg Radiol Anat 2003;25:315-21.